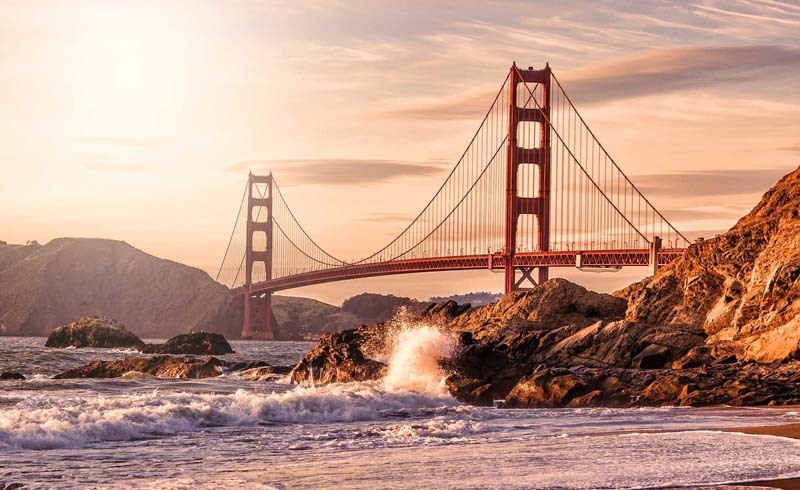 They're one of San Francisco's best-known natural landmarks: two towering “twin” peaks that rise above the city, providing spectacular views that stretch across the bay and as far south as the Santa Clara Valley. But there's much more to Twin Peaks than meets the eye. Here's your guide to discovering all there is to know about these two prominent hills and their surrounds. The region's Spanish settlers originally called Twin Peaks Los Pechos de la Choca, or “Breasts of the Maiden,” a descriptive name for its two adjacent peaks, each 922 feet tall and standing 660 feet apart, second only in height to the city's 928-foot-tall Mount Davidson. 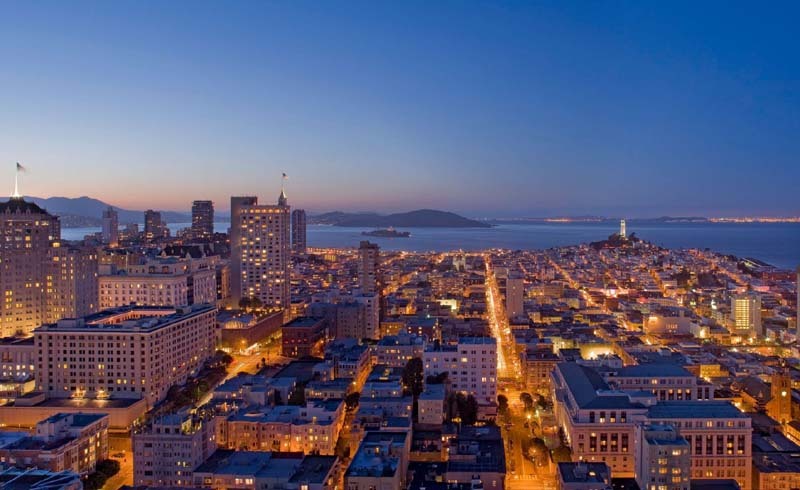 They stand close to San Francisco's geographical center and provide panoramic views of the city. For most people, a visit up to “Twin Peaks” refers to its north peak, “Eureka,” home to Christmas Tree Point overlook which offers 180-degree views of some of SF's most iconic attractions, including Alcatraz, the Golden Gate Bridge, and San Francisco Bay. Twin Peaks is a stop along San Francisco's Scenic 49-Mile Drive, which starts and ends at San Francisco's City Hall, though most visitors make their way up here on their own. Once here, there are several natural trails, including one that will lead you to 360-degree views—the Creeks to Peaks hike is a 1.8-mile (one-way) moderate-to-strenuous trek connecting Glen Canyon Park's Islais Creek to the south with the twin summits, and traversing through rugged red outcrops and windswept grasslands. For a more urban exploration, the climb from Twin Peaks Boulevard at Portola Drive to Twin Peaks' Christmas Tree Point is approximately 0.9 miles. One of the best area hikes is the Mount Sutro Clarendon Loop, a moderate five-mile excursion that begins at Mt. Sutro's Stanyan and 17th streets trailhead, continues along Sutro Forest's Historic Trail to the Clarendon trailhead, and then continues across Clarendon Avenue and past Sutro Tower to the trail left of Twin Peaks Reservoir. The 64-acre Twin Peaks Natural Area stretches across both peaks, creating an urban oasis of native plants and coastal scrub that attract coyotes, brush rabbits, and the endangered Mission Blue Butterfly, a stunningly exquisite lycaenid that's native to the Bay Area. Christmas Tree Point overlook is Twin Peaks' main viewing hub, a promontory that got its name from a 1927 publicity stunt involving the San Francisco Examiner and a holiday tree. It's about 70 feet lower than the peaks themselves, but features pay viewfinders, ample parking, and exquisite natural views. Twin Peaks is also a great workout for cyclists who climb to Christmas Tree Point by way of Portola Drive to the south or Clayton Street to the north, connecting with Twin Peaks Boulevard in both directions. With its central city location, Twin Peaks often serves as the cut-off point for San Francisco's notorious fog as it races in from the ocean. This means views of the Golden Gate Bridge and Golden Gate Park may be non-existent, while downtown SF and the East Bay still bask under blue skies. Like most of the city, Twin Peaks weather can change on a whim, and its often chillier and more windy up here than elsewhere in SF. Bring layers! Twin Peaks Boulevard is the main access road for Christmas Tree Point and the park's natural trails. If you're traveling by public transit, the 37 Corbett MUNI bus line (take it “outbound” from Market and Castro or Church streets, Cole and Carl streets, or Masonic and Haight streets) stops at Crestline Drive and Burnett Avenue. There's a path up the hill from here. Keep an eye out for poison oak when walking or hiking around the area. There's often a food truck selling soft-drinks, snacks, sandwiches in the Christmas Tree Point parking lot, but it's more affordable to bring your own—especially H20 for hiking. A self-cleaning public toilet is located at the lot's south end. You came, you saw, you conquered. Now that you've explored Twin Peaks and reveled in its natural beauty, what else is there to do? Thankfully, being in such a central location means there are plenty of nearby options. Depending on which direction you go, just down the hill from Twin Peaks are neighborhoods like Noe Valley, the Castro, and Cole Valley/Haight Asbury, each of them brimming with bars, restaurants, and plenty of shopping ops. If it's more nature you're after, Glen Canyon Park is a 60-acre wilderness with its own urban forest and over 3.5-miles of hiking trails. For a bit of added fun, swing by the Seward Street Slides at Seward Mini Park. A piece of cardboard makes the ride down these two steep side-by-side slides even more exhilarating.